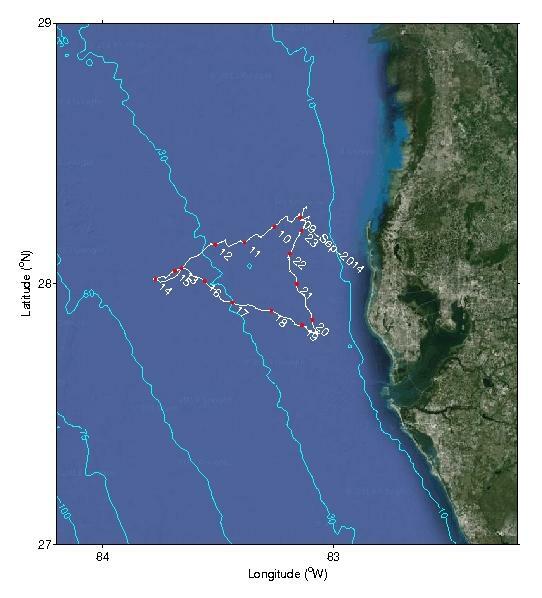 As a joint effort of tracking and predicting the red tides in the eastern Gulf of Mexico and the U.S. southest coasts, a Slocum glider (mission 60) was deployed off the west Florida coast by the Ocean Technology Group at College of Marine Science, University of South Florida. 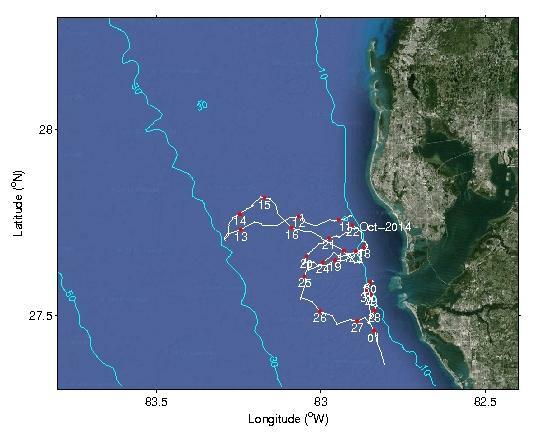 The glider had successfully collected oceanographic data across the West Florida Continental Shelf during September 8 - 23, 2014. The prelimminary data are shown in the following plots. Figure 1. Glider tracks (white) overlaid on the West Florida Shelf bathymetry (cyan). Daily time stamps (at 0 hour UTC) are shown along the glider track. Figure 2. 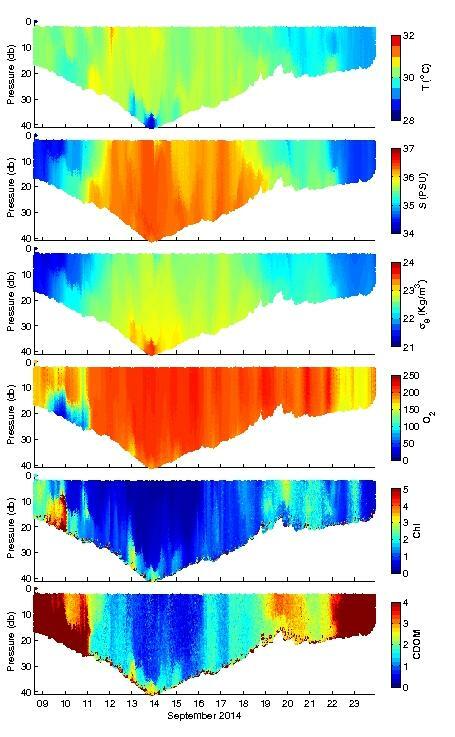 Preliminary data collected by the glider: water temperature, salinity, density anomaly, dissolved oxygen, Chlorophyll, and CDOM records along the glider transect. Figure 3. 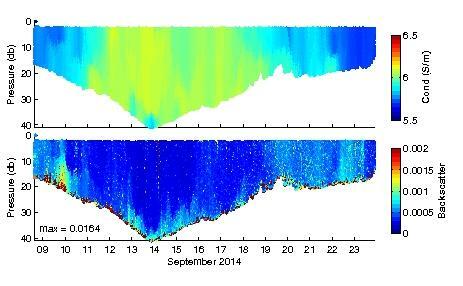 Preliminary data collected by the glider: water conductivity and backscatter records along the glider transect. 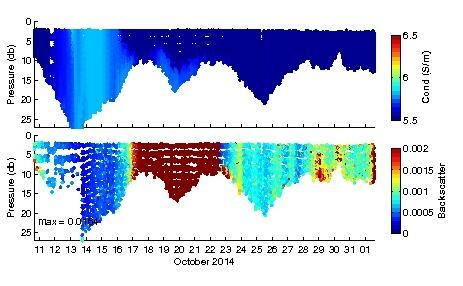 The lower temporal resolution dataset can be downloaded from http://cotprojects.marine.usf.edu/data/gg/m60/. The glider position data can be explored interactively from the CROW website, and a KML file can also be downloaded there. 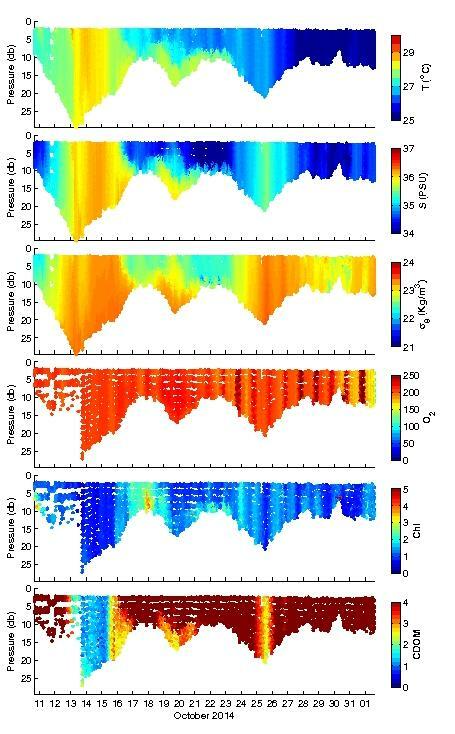 Liu, Y., R.H. Weisberg, and C. Lembke (2015), Glider salinity correction for unpumped CTD sensors across a sharp thermocline, in	Coastal Ocean Observing Systems, 305-325, Elsevier (Academic Press), London, UK, http://dx.doi.org/10.1016/B978-0-12-802022-7.00017-1. Ocean Circulation Group, College of Marine Science, University of South Florida. The preliminary data are research products under development. No warranty is made, expressed or implied, regarding accuracy, or regarding the suitability for any particular application. All rights reserved University of South Florida. Copyright University of South Florida 2014.